It is a good day when the university newspaper features a linguistic — yes! LINGUISTIC! — topic on the front page. As for the eastside/westside dialectal battle … I’m mostly Philly (I grew up just north of there), but I don’t “yous.” Here in State College, I feel like that puts me in the minority. Despite being the geographic center of the state, this town is definitely full of dialectal westsiders. Do you agree? What are you? Do people “yinz” or “yous” in other parts of the country? 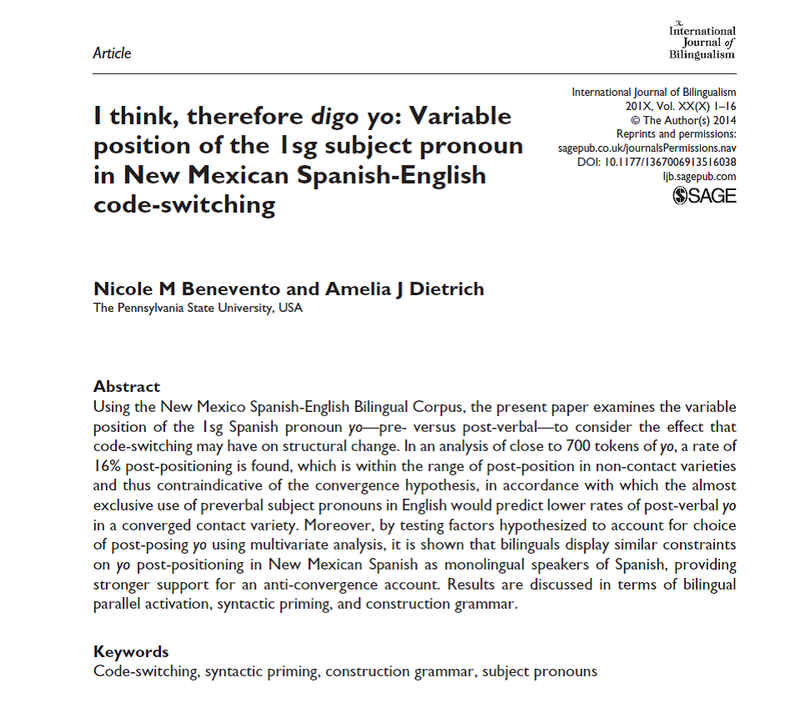 My paper on the variable position of 1sg yo , written with my dear colleague and friend Nicole Benevento, is now available online at the International Journal of Bilingualism. This paper will appear in print form as a part of a special issue titled “Code-switching in the community: unraveling contact-induced change,” containing papers on many different topics of interest in New Mexican Spanish-English code-switching as found in the NMSEB corpus (Torres Cacoullos & Travis, in preparation). I am at my gate in the MDT airport waiting for my delayed flight to Chicago for the MLA. The woman working the desk, who I later learned is named Marisol – has a Spanish accent of only middling thickness and she just made an announcement for a SkyCap to bring a wheelchair to the gate for the arriving flight. It’s “accented” English, but understandable. Immediately after her announcement clicks off a woman with a distinctively central PA accent repeats the same request over the loudspeaker. As soon as that announcement clicks off, Marisol’s walkie-talkie comes in with some static and a condescending: “…don’t know what the heck you’re talking about Marisol…” Marisol politely, if sheepishly, responds: “It’s already taken care of, but thank you,” and goes back to work. In fact, a wheelchair is rolling up to the boarding area right now. I’m left wishing I knew where the lady on the other end of that walkie-talkie is so that I would have somewhere to cast my angry glares. And yet, something in the whole interaction makes me think she thought she was really looking out for her buddy Marisol. Why is this acceptable behavior? Why do we adjust to some accents and not others? Have you ever had any similar experiences (as witness or participant)? What do you think? This came from 2 girls in a class I substituted for a friend of mine a couple of weeks ago. They approached me sheepishly after class. What they meant was that I sound like a native speaker of English, but to their 200-level learner ears, I also sound like a native speaker of Spanish. I was flattered and used it as an opportunity to encourage them to work hard in class and study abroad if they can, but there’s something else afoot, no? Their usual teacher, as they mentioned, has lived in the US for 10 years and still has a very heavily accented English. He knows more colloquial American expressions and cultural references than I do for any Latin American or Spanish culture, but they’re tuned into pronunciation, not word choice. This made me wonder, does their perception of us have an impact on their learning? Do they pay more attention to me or him? Are they more motivated by one or the other of us? Whales can speak dolphin! Who knew?! I officially submitted my dissertation today.